If you’re planning on listening to some bassy music, a standard aftermarket car stereo system isn’t necessarily going to do the job. To get that extra oomph, you’re going to need a dedicated active or passive subwoofer to deliver the power you need. The best 10 inch subwoofer is going to not only grant you great bass response, but it’s going to provide you with excellent volume as well, so take a look at this guide; it has nine worthwhile products for your consideration. What is the Best 10 Inch Subwoofers in April 2019? Magnet Size: the Bigger, the Better? This product from JL Audio has a great level of audio performance and has a good level of versatility for different amps. Not only does it have an impedance of four ohms, but this is a dual-coil system sub that will allow you to connect to amps at either two or eight ohms of impedance. Additionally, it has an RMS of 600 watts, so you get a good level of continuous power with these JL Audio subs. There’s not a lot to dislike with these JL Audio 10W6v3-D4 speakers. These subwoofers are one of the few on the market that is considered distortion-less. As a rule, you can expect deep thrumming and bright tones in both full and low registers, and the fact that there’s a good level of compatibility with most amplifiers helps cement the high-quality nature of the sub. These mount easily and don’t take up a lot of space and create a sound you wouldn’t expect from a 10-inch sub. Overall, if you have the cash, this is undoubtedly a worthwhile investment. It has some of the highest sonic clarity available currently and doesn’t take up a lot of space. If you’re looking for a shallow mount sub, the Pioneer TS-SW2502S4 has a reasonably compact design with a depth of 3 1/8 inches. This means that it’ll install easier in smaller vehicle spaces like behind a cab, but it doesn’t mean that it has to sacrifice performance. To start, it has a good level of RMS at 300, and it also has a 1200-watt peak performance. One of the standout features of the subwoofer is its budget-friendly price; you just won’t have to spend much for some intense and bright tones. This isn’t a product that’s necessarily designed to handle a lot of power, so you’ll have to be careful not to blow it out. Also, this product doesn’t fit in standard 10-inch subwoofer boxes, so you may have to do a custom job. This product simply delivers a lot of performance for its size. In a lot of cases, shallow mount products tend to underperform, but this delivers the goods for the price. It even provides a reasonably wide frequency range of 12Hz to 12,500Hz. Overall, if you need a powerhouse product for a smaller vehicle, this Pioneer sub installs in almost any location. It also fits in some Pioneer and custom boxes, so running two in a dual-sub setup is reasonably easy to accomplish, especially with the lower price point. The next product in the guide comes in two varieties that pack in four and two-ohm levels of impedance. Both variations utilize a double-coil design, and both are also designed to be used as shallow mount units that you can install in a wide variety of tight spaces. The SD-3 10D series from Sundown Audio is also known for its excellent audio fidelity; it has a great black aluminum voice coil that manages heat dissipation with a high level of efficiency. Sometimes, a substantial power load can cause these subs to blow out. Also, these can experience a bit of distortion. The frequency response also isn’t as broad as it could be. As a shallow mount product, you’d think that the RMS would suffer, but these put out an impressive continuous stream of 500-watt power. In addition to this, both models also don’t have a rear vent, so mounting it flat up against an enclosure won’t cause overheating. With an RMS of 500-watts, these are shallow mount speakers that can keep the power going reasonably continuously. If you’re looking for a subwoofer that can work well with multiple impedances on most car amps, then this is a good option. This subwoofer, which is manufactured by Rockford Fosgate, is another product that comes in both a two– and four-ohm variant. 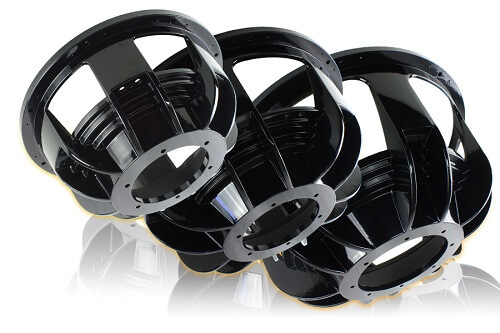 The voice coil that this product uses is two inches and has a copper-clad aluminum construction. Its RMS is set at 250 watts, which provides a reasonably robust amount of continuous sonic power. It also uses a mica-injected polypropylene core. This cone can move a good amount of air, which helps it produce some good-sounding bass tones. These are subs that don’t have a lot of extra bells and whistles thanks to the low price point. They are decent for an excellent sonic performance, but if you want loud volumes, it’s best to choose another product. 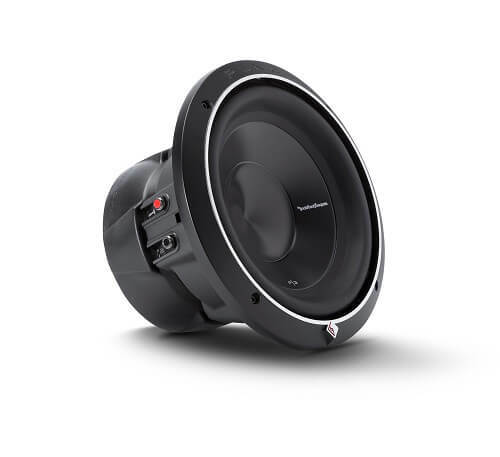 If you want performance, the common misconception is that you’ll have to pay for a premium experience, but this Rockford Fosgate product manages to generate good bass without costing a ton of money. They are relatively easy to install and are an excellent upgrade for most car audio systems. These are great for anyone that wants a good amount of frequency response but doesn’t want to break the bank. These even have a dual-coil design, so you’ll find that they are reasonably adaptable to most amp setups. When you want a lot of wiggle room, then a sub with a good amount of peak power can deliver. With this power, your deepest notes will have all of the power and volume they need to be genuinely earthshaking. This Alpine Type R sub comes in both a four- and two-ohm design, so you’ll have some options with your amp connection. Both of the models even have a dual voice coil design. These are definitely on the larger side of things, so if you have a small car, you’re going to have issues fitting them. Additionally, the manual is also somewhat confusing, which is why many seek online resources for setup. When it comes to continuous power, these generate a good amount of volume via a 750-watt RMS, and if you want a product without noteworthy distortion, there are few products on the market with a cleaner sound. Between the RMS and the peak power, you’ll be satisfied if you live the deep, thrumming vibrations that a premium subwoofer can generate. One of the best features of this Alpine subwoofer line is how distortion-free the subs are. They are a bit on the larger side, but overall, if you want a good level of performance without spending a ton, these are good subs to consider. Another subwoofer that’s available in dual-coil four- and two-ohm varieties, the CompR is one of Kickers best options in their catalog of products. One of the more useful aspects of this product is the impedance slider, which makes it easy to match the subs with a good amp. When it comes to continuous output, these have a 400-watt RMS, and in bursts, it has a nice peak power of 800 watts. The cone is all polypropylene, so you can expect a good level of air compression and movement so that you’ll get a steady sound. With a high volume, you may experience some distortion with this subwoofer. With a depth of five and a quarter inches, you’ll find that this subwoofer has a lot of versatility when you’re trying to install it. These are also exceptionally durable, so you can feel safe installing them in a wide variety of places without worrying about damage. The basket is also reasonably well-designed, and the subwoofer has good heat dissipation capabilities. For a more standalone experience, the Punch, which also known as the active subwoofer, can work wonders. This product, which has an internal amplifier, provides a good amount of sound quality. Like other active systems, you’ll need an AC power supply as well as the standard speaker connectors to run the system. The RMS on this is 300, which is certainly decent for the price point. This isn’t the most durable subwoofer on the market, and the amp also can blow out after a few years’ worths of playing. The knob placement isn’t optimal since they would be a bit more accessible if they were towards the top of the unit. Also, the sizing is a bit large for many smaller vehicles. Despite a couple of flaws, installing an excellent active sub like this one can save you time since you won’t have also to install an amplifier. 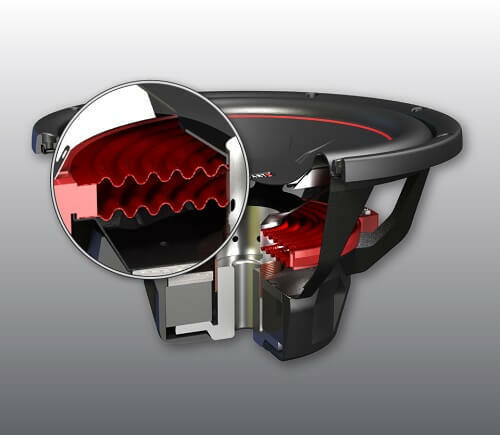 It also has a closed-look wiring design that makes the crossover performance between speaker components nearly seamless. There’s also a good amount of thermal and voltage protection on the product as well. The Punch series of Rockford Fosgate speakers has earned its name by having a punchy performance that’s good for bass sound articulation. This product, which uses an active system cuts down on the need to purchase an additional amplifier and provides a high degree of sound quality. You don’t have to sacrifice bass performance when you’re under a budget. These Dayton Audio subs boast a double-coil functionality with a four-ohm impedance. This allows these to work for a few wiring options and opens up your matching opportunities when it comes to the attached amplifier. These also have a excellent RMS of 600, which will provide a good amount of steady power output. At 17 pounds, these are definitely heavy speakers for the size. Additionally, they can have too big of a depth for some smaller applications. These can be a bit too powerful for some users. Despite being positioned in a tiny sealed enclosure, these subwoofers move a lot of air. Despite its lowish price point, you can get a good amount of bass performance out of these. They have a frequency response that dips below 30Hz for those thrumming bass tones. Additionally, you won’t experience much distortion with these subs. Overall, these Dayton Audio subs deliver a good amount of performance for their low price point, and it’s relatively easy to hook them up to a dedicated amplifier. The final product in the guide also has an option for two- and four-ohm impedance variants. Each has a dual-coil design that uses copper-clad aluminum voice coils to help move the cone. These coils are designed to take advantage of unique venting tech that enables them to cool quickly and maintain a balanced temperature. The continuous power for these subs is 500 watts, which is a good RMS for the price point. Due to the unique installation system (Flex-fit), these subs can be somewhat tricky to install. Also, some lower frequencies can sound very distorted. The cone on this sub is made of anodized aluminum, which is designed to keep its shape longer despite changes in temperature. This helps the sub attain a good level of bass depth and volume. Additionally, Rockford Fosgate utilized a unique technology in the basket that makes it very easy to install, even in extreme configurations. Another subwoofer in the Punch line of Rockford Fosgate subs, this product does have all of the punch that the line is famous for. They have a good, balanced bass performance and a good level of RMS. When you’re looking for a new subwoofer, you’re going to be bombarded with information, but one of the more essential differences in the type of sub will be whether or not it’s passive or active (powered). The difference between these two types is pretty important and put simply; the passive variation is just the subwoofer while the powered kind of sub also includes an internal amplifier. As a result, when you’re working with a sub without an amp (passive), you’re going to need an external amplifier, but as a rule, your sub will only have a single wire that will provide both AC power and audio signal. For this reason, passive units tend to be much cheaper and easier to heft than powered subs, especially if you have a preexisting amplifier. This is also a feature that sets these apart: they are upgradeable; when you’re ready to get a better amp, it’s easily done as long as the impedance matches up. One of the disadvantages of the passive subwoofer is that you’ll need to be tethered to an amp to receive optimal performance, and if you have a shorter speaker wire, you may run into troubles with spacing. Additionally, using a passive system may require that you use multiple amplifiers, which can complicate things somewhat. Active subs also take up less physical space due to the fact that they have internal amplifiers. Also, these can be cheaper in the long run due to the fact that you don’t have to purchase an amplifier. With all of this taken into consideration, powered subs also have a preset amplifier built-in, so you aren’t going to be able to upgrade it. Additionally, you won’t have to incorporate extra amplifiers in your audio setup with a powered unit. You can also daisy chain multiple powered subwoofers together without the need to bring extra amps. With all this taken into consideration, the biggest drawback of an active sub is the fact that an extra internal amp will drive up the weight. Additionally, these tend to be a bit more expensive than their passive counterparts. Another piece of subwoofer jargon that you’re sure to encounter has to do with whether the sub is a single (SVC) or double coil (DVC) product. SVC or DVC subwoofers have a slight difference: dual coil subs have a second coil wrapped around the former, which is the component of the speaker that manages the current from the amp. While both of these coil systems attach at this junction, double coil setups have a little bit more adjustability since they can be wired at two different levels of performance, which are usually two- and eight-ohms on a four-ohm sub. Single coils, on the other hand, can only be wired at the prescribed ohm level. As a result, the double-coil setup is a bit more flexible when you’re attaching an amp to the sub. When you’re trying to match a passive system with its ideal amplifier, it can feel a bit like putting together a fairly complex puzzle. To help you do this more efficiently, it’s a good idea to take a look at two primary stats when deciding on sub/amp compatibility: RMS and impedance. The RMS, which means root mean square, is the amount of continuous power a subwoofer can handle continuously. Each amplifier has a total RMS rating that it can manage without damage. To ensure compatibility, you may need to multiply the number of subwoofers you have using their RMS rating to decide if the amplifier can handle the continuous power load. The impedance of the subwoofer, on the other hand, helps the amplifier determine how much of a power load the sub can handle. This is typically measured in ohms, and the amp will supply the amount of power that it detects the subwoofer can handle. An amplifier will usually work at one, two, and four ohms, and each of these has its prescribed wattage that you’ll need to match with the subwoofer for optimal performance. Subwoofers are driven by magnets, and when power is transmitted through the coil, it generates either a positive or negative charge. This charge then interacts with the internal magnet – if it’s positive, the coil is pushed away, but if it’s negative, the complete opposite happens. The coil is what moves the cone of the speaker, which then drives the air and generates the sound. Now, is it better to have a larger magnet inside your speaker? Well, while it’s beneficial to have a magnet with a strong magnetic field, having it have a more substantial sizing isn’t going to always provide much extra force. 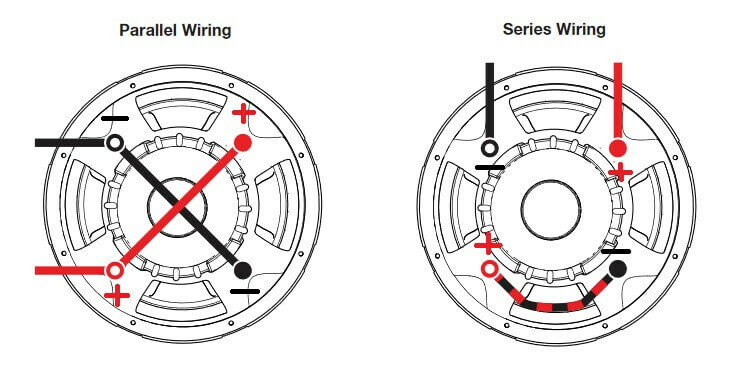 More critical factors in the functioning of a subwoofer are the size of the coil, the suspension system, and the internal airflow, especially since the way the coil helps the cone move air is where all of the power is generated. When purchasing subwoofers, you’ll also encounter several basket types, which include stamped, cast, or hybrid. The basket of the sub works as the support structure for the cone and the coils, so it’s an essential component. When you’re working with a stamped basket, you’ll find that they are the strongest and won’t typically bend. A cast basket has a much less rigid construction and can bend with enough force. Which you pick will vary on needs, but it’s important to understand that stamped tend to be a bit more resonant than cast. Having said that, cast baskets tend to be better at managing excess heat. Fortunately, hybrid baskets bring the advantages of stamped and cast baskets to a single unit. These tend to be both strong and lightweight. Foam – This material helps to keep the cone nice and centered. Also, these tend to last up to 16 years without the need to replace them. Urethane – These have a nice flex to them and are known for their high durability level. Santoprene – If you need a long lifespan, Santoprene surrounds tend to last the longest. They are also very flexible and do a good job of staying intact in temperature extremes. Polypropylene – This is a highly rigid cone material that also has an unusually long lifespan. Treated Paper – Treated paper is not only light and moveable, but it can utilize coatings that boost its durability. Kevlar –This is a very strong yet lightweight material that can handle the pressures of a sub very well. Carbon Fiber – Carbon fiber is exceptionally tough and also very lightweight. Sometimes, they can experience a break-up, which will cause a hissing sound. Aluminum – This cone keeps its shape even when heated to higher temperatures. Magnesium – Magnesium surrounds are fairly common on the market and tend to muffle higher pitches and resonance. For those that don’t know, the spider of the subwoofer is the component that sits directly beneath the cone that’s designed to keep the cone centered while it moves. Usually, the spider is crafted and coated with resin so that it stiffens and takes on shock-absorbing traits. These come in a variety of materials, which can include cotton, treated paper, nomex, conex, or a poly-cotton blend, but what most affects the spider’s functionality is the frequency of the spider’s cardboard-like corrugations. These corrugations and the amount of valleys and peaks can definitely affect the sound of the subwoofer. Too many corrugations can cause spider sag, which can great affect the fidelity of your subs. Additionally, some spiders can be singed by the high temperature conditions inside the subwoofer. Typically, this is happens with cotton spiders unless they are treated with flame retardant chemicals. We hope that this guide on subwoofers has provided you with some leads for your next subwoofer system. The subwoofer is a powerful audio system component and finding the right one for your needs is essential. The products that we’ve selected are all excellent subs, so take a look at the guide, and you’re sure to find one that fits your needs.